Ukrainian-born violinist Sophia Novak-Sogland began her studies on violin at the age of four with her mother, a protege of the great Russian violinist David Oistrakh. Later, her parents– both violinists in the Kiev Philarmonic Orchestra – sent her to the Kiev Central Music School for Gifted Children. Since 1985, Ms. Sogland has resided in Boston, where she is a faculty member of the Longy School of Music and the New England Conservatory. 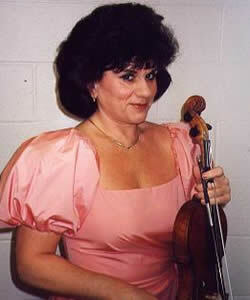 She is an active participant in Boston’s rich musical life as a soloist, chamber musician, and sought-after pedagogue. Ms. Sogland has played with the Kiev Philharmonic, the Santa Cecilia Orchestra of Rome, the Boston Opera Orchestra, the Synfo Nova Chamber Orchestra, and the Boston Symphony Orchestra. Ms. Sogland was a Grand Prize winner at the Herbert von Karajan Competition in Berlin in 1972.